Hellllooooooo, from Tokyo! After a couple of really early mornings, Jessica and I are officially on the right time zone. On our first full day back in Japan, we didn’t plan out anything too crazy just in case we got tired and needed to rest. But rest we did not! We walked nearly 25,000 steps on that first day, re-exploring Harajuku, Omotesando and Shibuya. On our last trip here the weather was completely different (cold and cloudy), so it was fun taking to the streets with the sun shining and without a bunch of layers on! We found this mural by Stephen Powers a few blocks from one of the entrances to Takeshita Street, the main hub of Harajuku shopping. It reads: NOW IS FOREVER. On our last trip in November 2016, we stayed in the Ginza district. While discovering Tokyo last time we found this cute little neighborhood behind the grand Omotesando shopping area, and decided it would be the perfect place to set up shop this time around. We spent a good amount of time on that first day checking out the streets around our AirBnB! It’s SUCH a cute spot – I’ll share more details on that later, but there are a bunch of adorable coffee shops, quaint eateries, boutiques, salons and more, all within a short walk of our place. Also, I’ll be sharing our full Tokyo itinerary soon too, so stay tuned! 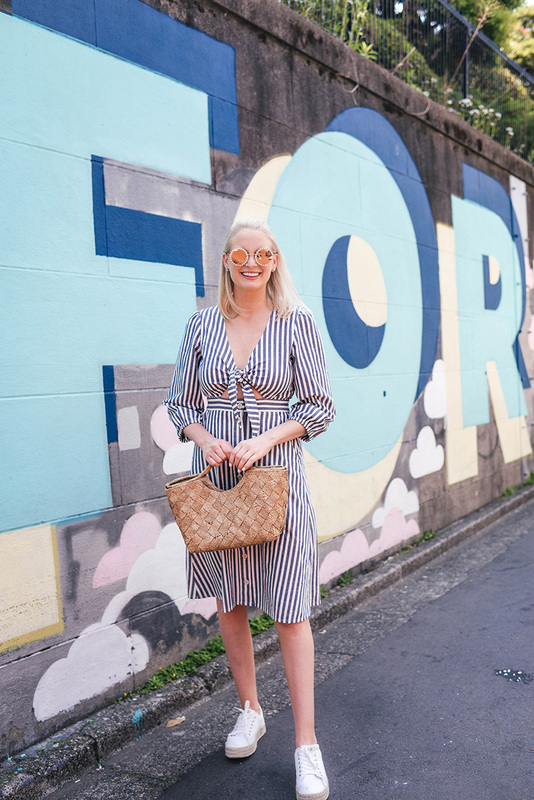 For our first day I wanted to wear something fuss-free that would keep me cool in the humid 80 degree weather, but also be flattering and cute for shopping, sightseeing and lunch. 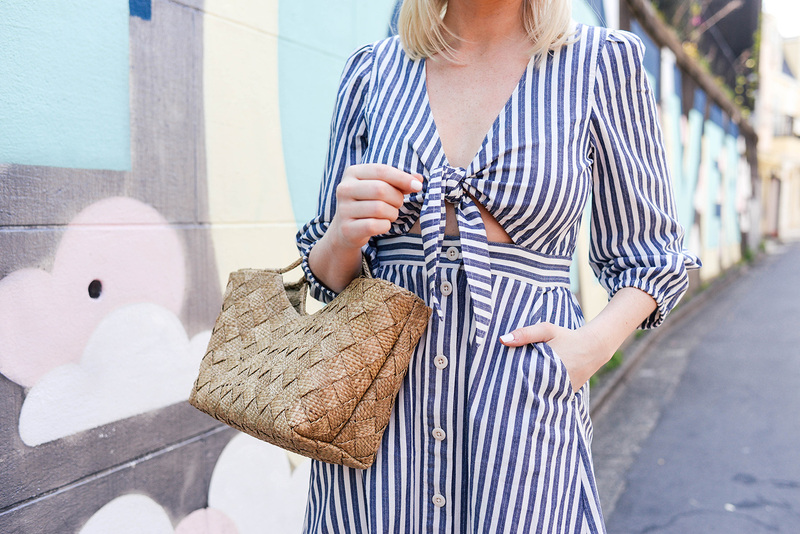 This Madewell dress was the perfect choice! It’s been going in and out of stock quite a bit, but keep an eye on it. I bet your size will come back in stock soon! 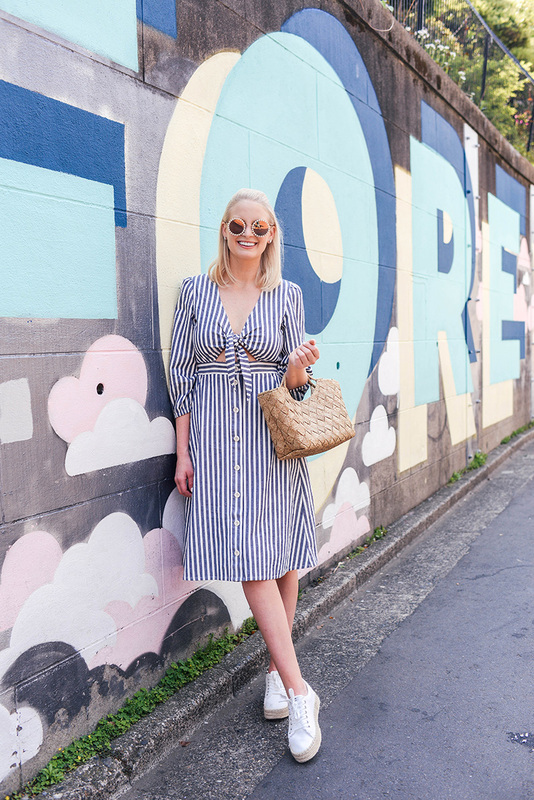 The fit is almost too good (I’m wearing a 4) – I love the midi length and the sleeves, but I also love the cinched waist and peek-a-boo cutout that add a youthful touch. PS – now that I’ve worn these shoes for a full day of walking, I can tell you that you absolutely must wear socks with these! I had a blister on my ankle before putting these on, and these made it ten times worse. The second I put socks on though, it changed the game!! Have fun in Tokyo, loving this cute look. Your trip sounds amazing!! And that Madewell dress is so cute! I’m loving your insta stories from Japan! Looks like you’re having a great time :) LOVE this cute straw bag! 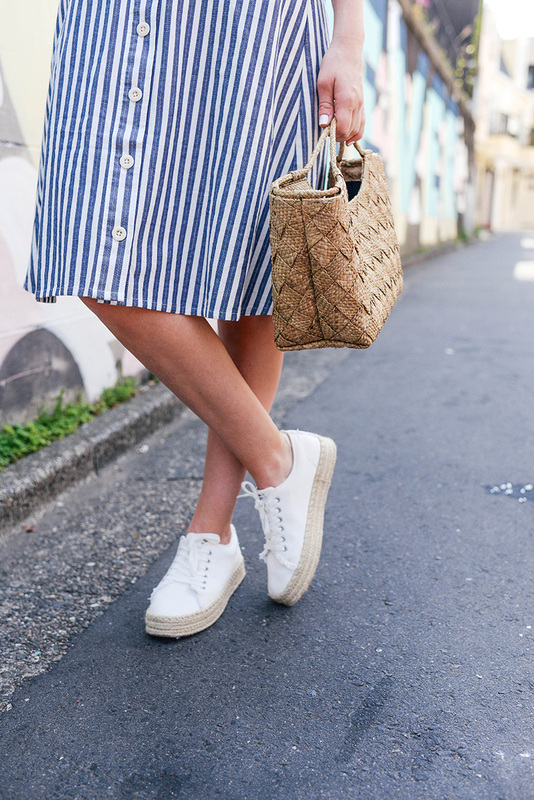 It’s the perfect spring staple.